Intelligent building systems technology based on the KNX standard provides variable control of multimedia technology throughout the entire home and building. 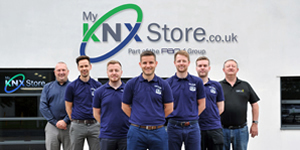 KNX manufacturers are developing solutions for so-called multi-room systems which are becoming increasingly simple and convenient – for both the user as well as the installer. At the fair “Integrated Systems Europe 2014 (ISE 2014)”, KNX members are showing solutions for visualization on portable devices (smartphones, tables and PCs), remote communication as well as audio & video applications in home automation at the KNX joint-booth which are becoming increasingly simple and convenient for a green home and building automation. Visit us at the booth 7N176. 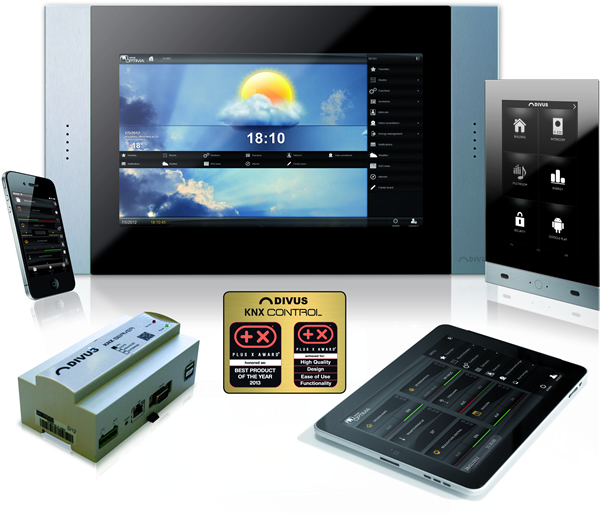 DIVUS TOUCHZONE revolutionises KNX visualization using the Android operating system. Additional KNX Visualisation APPs (DIVUS, GIRA, B-CON, JUNG, etc.) allow the user to use the TOUCHZONE as an intercom unit. The DIVUS VIDEOPHONE APP based on SIP technology supports communication to IP intercoms (2N Hellios, ROBIN, Mobotix t22, etc.) and analogue systems (SIEDLE, GIRA, TCS, ELCOM, RITTO, JUNG, etc.) via the DIVUS VIDEOPHONE BOX. Multi-room systems can also be employed. APPs and access by AMX, REVOX, Crestron, TRIVUM, Control4 allow for complete music management. Divus also presents the DIVUS OPTIMA, a Design Plus Award winning KNX solution with new and user-friendly features including a side-scripting module that allows experienced and advanced users to expand the KNX SERVER and KNX SUPERIO with their own application scripts. In addition to SONOS and DUNE scripts, the server software and hardware interfaces can implement and develop basic user functions. 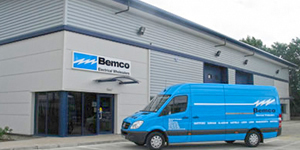 The Alarm Management system allows users to easily configure display features to obtain consumption values (electricity, heating, water, etc.). Current or historical data may be viewed. The system displays determined periods (day, previous day, week, month, six months, year) specified by the end-user with online views (bar, curve, mean, limits, etc.). The system monitors limits and acts on the controller when upper/lower limits are reached. 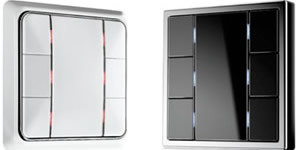 “System Corlo” is the switching series around the Corlo Touch display. Matching push buttons and sockets create a comprehensive design concept in the room. Real glass surfaces and chromium-plated frames make the series a showpiece for high quality interiors. 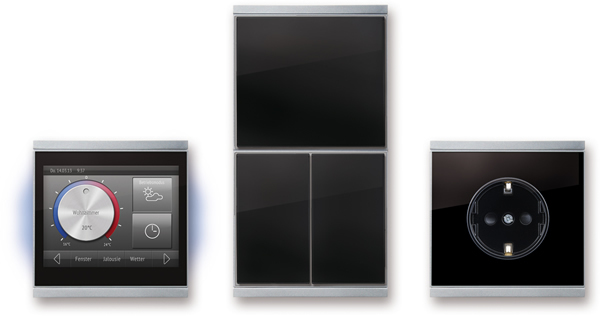 The Corlo Touch KNX display controls room temperature, sun shade, ventilation and light via the KNX bus system. 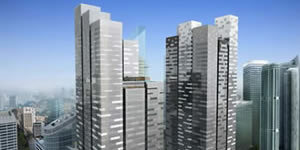 For manual operation of the building system, the touchscreen displays, e.g. switches and rotary controllers. You can load your own pictures from a SD card. The extended “WL” model communicates over W-LAN, so that you can, for example, display websites or images from an IP camera. This way, smartphone control also becomes possible. The Corlo push buttons are available as mechanical interface with integrated temperature sensor, and as a solar wireless button. ITP 1000 VOIP intercom is an intercom with special vandalism protection, touch through glass technology and has an embedded RF-ID reader. It has a user friendly design for multi-dwelling units and is suited for luxury residences with unlimited number of apartments. ITP1000 delivers full-motion video over IP intercom and the stability of wideband audio intercom for clear communication and video security in your home or business. ITP1000 comes in 2 stylish colours -Shiny Black and Cream White. 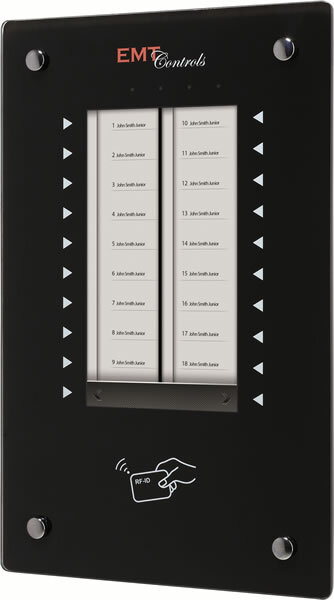 This product is available with different options such as colours, number of buttons and various visuals on screen. 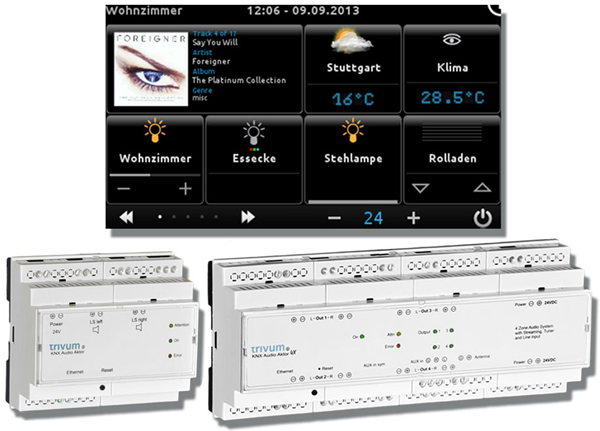 The First All in One Visualization for Mobile Clients: One configuration for all different clients and resolutions: The KNX proServ controller with its brand new product database allows designing the whole User Interface with your standard ETS Software. No need to export group addresses, to download a graphical editor, to create and service a separate project. Just download the ETS parameters to proServ, connect an iPhone, iPad or Android device – and get it configured in seconds. No software license or hidden fees, free app on Apple® store or Android® market. No limits in KNX functionality: Control lights, blinds, shutters, save and recall scenes, check and set temperatures or modes for HVAC, adjust presets and compare them graphically with the actual value, view weather station and all kind of KNX metering values, every KNX data format available. Switch with one touch to your favourite IP camera or music app. 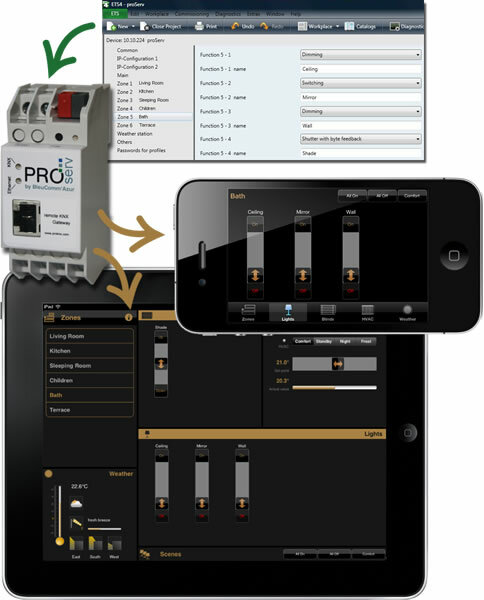 Use the proServ controller additionally as IP programming interface for ETS, remote access possible. trivum brings you the new AudioBox. It is a retrofit music system in a high quality aluminium frame, designed to be placed in the apartment as a visible component with an agreeable design. The technical features leave nothing to be desired: streaming client from network drives, internet music services, internet radio, Apple AirPlay, and FM tuner with integrated digital amplifiers and a powerful DSP. The trivum AudioBox can be combined with all trivum audio actuators for a perfect multiroom experience. Like all trivum products it is fully KNX compatible in order to integrate it in existing KNX systems. trivum also presents the audio actuator 4x. 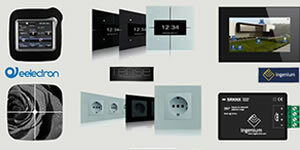 Planners and electricians get a complete four zone multiroom music streaming system for the distribution cabinet. The actuator streams music from network drives, internet music services, internet radio stations, and via Apple AirPlay. In addition, an FM tuner and analog input is integrated. The twelve units wide REG chassis of the audio actuator 4x can be installed with little effort and is easily configured by webconfig. The integrated amplifier and the digital signal processor (DSP) provide a full-fledged multiroom music system. The trivum audio actuator 4x allow for a tidy environment at your customer’s home without any visible cabling and audio components.